Proton Satria Neo S2000 driver Alister McRae has been awarded second outright in the season ending IRC Rally of Scotland following the exclusion of the winning Peugeot piloted by Irishman Kris Meeke. Proton’s ex-driver Guy Wilks, who now drives a Skoda Fabia, has been declared the winner. Scotsman McRae reveled in his appearance on home soil, just seven days after almost capturing a podium on the Rally of China in a similar Satria Neo S2000. 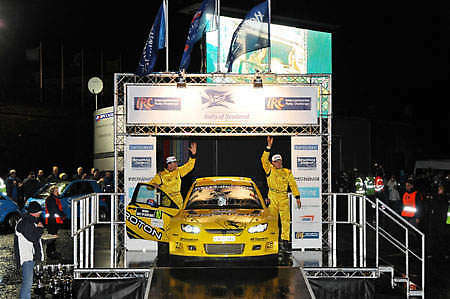 He made it this time by finishing third, giving Proton its first ever podium in the Intercontinental Rally Challenge. Meeke, the 2009 IRC champion was faulted by the stewards for having a front subframe that is lighter than permitted. McRae, a former British and Asia-Pacific champion who now lives in Perth, was delighted with the Mellors Elliott Motorsport Proton Satria Neo S2000 and says he now the wants to do more rallies in the car in 2010. “The Proton chassis is one of the best I have ever driven. We’re doing the full IRC next year. We are looking forward to coming back and fighting these guys again,” he said. The Satria Neo S2000 was only homologated in October 2008. It made its debut on the IRC in June at the Belgium Ypres Rally and the car has quickly shown its potential. Team principal Chris Mellors has confirmed that a full IRC campaign alongside an attack on the Asia Pacific series is already in preparation for 2010. He said that the team is looking at a four-car program for 2010 – two in the IRC and two in the FIA Asia-Pacific Championship. The Satria’s 2.0-litre Super 2000 engine is derived from the 1.8 litre Renault engine fitted to the Waja and has been further developed by MEM to produce a reliable 278bhp at 7600rpm with a usable power band from 5,500 to 8,500rpm. It uses a six-speed sequential Xtrac 4WD gearbox, one of two control transmission systems allowed under FIA rules. For a more in-depth technical view see Paul’s earlier post. Previous Post: Fancy a “North Korean” Hyundai i30?